do goblins know common tongue? or do alyia or someone cast Comprehend Languages and talk to them maybe we can use them to our advantage? Posted on 2013-09-10 at 23:19:39. Just what Goblins are good bet that most of this clan do not know common. The Chief and the leader types most likely did but they are dead. Comprehend Languages would help yes. Posted on 2013-09-10 at 23:26:12. I have a PM into Tann with a question which I think will handle the 'translation' issue. If it comes back as I hope, then I will make a minor edit to my post. Posted on 2013-09-11 at 00:00:09. Ulthok speaks Goblin so he could give them direction. Posted on 2013-09-11 at 00:47:15. I edited my post as I had forgotten that Jessica's helm allows her to speak and understand Goblin. Posted on 2013-09-11 at 01:15:40. What are we going to say? Sorry for slaughtering all your menfolk, but they started it? Posted on 2013-09-11 at 02:43:16. Not need to be polite. These are NOT kittens. Think rats with weapons. They ARE NOT CUTE!!!!!! Posted on 2013-09-11 at 02:55:22. Posted on 2013-09-11 at 03:23:07. So I just had to post Astrid's pic. Posted on 2013-09-11 at 03:46:58. A goblin tribe has an exact pecking order; each member knows who is above him and who is below him. They fight amongst themselves constantly to move up this social ladder. We now have to prove to them we are the top of ladder so they won't try to challenge us. They kill for the fun of it and we don't want any of them getting any ideas. Ecology: Goblins live only 50 years or so. They do not need to eat much, but will kill just for the pleasure of it. They eat any creature from rats and snakes to humans. In lean times they will eat carrion. Goblins usually spoil their habitat, driving game from it and depleting the area of all resources. They are decent miners, able to note new or unusual construction in an underground area 25% of the time, and any habitat will soon be expanded by a maze-like network of tunnels. Posted on 2013-09-11 at 14:43:28. 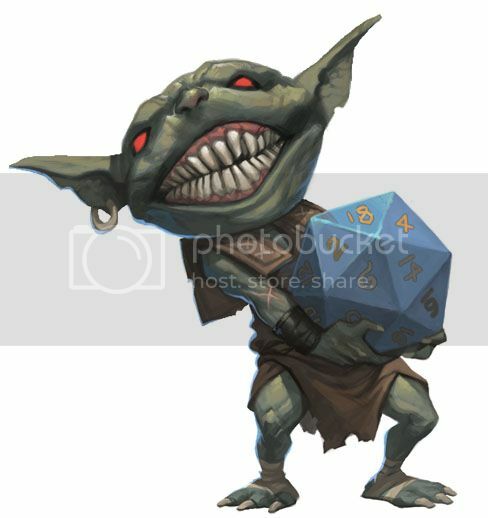 What if these goblins are different? Read a few pages of this. Posted on 2013-09-11 at 15:53:22. I have shortcuts to that series and really love it. But those Goblin are leveling and changing. Fumble's felt bad about hurting the Elvin child. If our Goblins were moving toward "Good" they wouldn't be in this castle. But they are not. They would feed their own young to the wargs to keep them from eating themselves. They just feed ,breed and make things bleed. If Ulthok were still CN it wouldn't bother him to eat one to scare the rest, but he is now CG so that's no longer in his nature. Besides Rat most likely tastes better. Posted on 2013-09-11 at 16:23:42. "I am the Sayer of the Law"
"For every one the want that is bad. What you will want we do not know; we shall know. Some want to follow things that move, to watch and slink and wait and spring; to kill and bite, bite deep and rich, sucking the blood. It is bad. Not to chase other Men; that is the Law. Are we not Men? Not to eat Flesh or Fish; that is the Law. Are we not Men?" "Evil are the punishments of those who break the Law." In other words; we are not Goblins. We shouldn't have to stoop to their level. Are we not men, and women? Posted on 2013-09-11 at 19:03:33. ...I'm a dwarf, lady, an' them gobs there ain't nuttin' but breed'rs o' more gobs if we lets 'em live! I says we flattens 'em. That'd be Barreel's thoughts on the matter, anyway... Of course, if the general consensus is to let the quivering masses live, he'll go along, but is liable to make a threat or two just for good measure. If I can get work to leave me alone for a minute and a half, I'll whip up a post along those lines. Somebody wanna run interferance with the users for me? Posted on 2013-09-11 at 19:16:49. Posted on 2013-09-11 at 19:28:38.